The Regular Season in LBL just ended. Here is the last round review presented by ESL. The most exciting game was a derby match between two local teams from Beirut: Homentmen (#3) and Al Riyadi (#2). Homentmen (12-4) won against visiting Al Riyadi (12-4) 112-97. It ended at the same time the three-game winning streak of Al Riyadi. Homentmen dominated down low during the game scoring 62 of its points in the paint compared to Al Riyadi's 42 and made 20-of-23 free shots (87.0 percent) during the game. U.S. Virgin Islands-Puerto Rican point guard Walter Hodge (183-86, college: Florida) fired 50 points (!!!) and 9 assists for the winners. 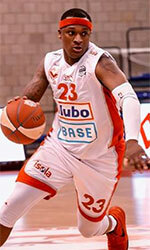 International forward Gerard Hadidian (201-95, college: Lake Land CC) chipped in 14 points and 10 rebounds. Naturalized Egyptian power forward Ahmad Ismail (205-76) produced 29 points and 8 rebounds for lost side. Defending champion moved-up to second place, which they share with Al Riyadi and Beirut Club. Bottom-ranked Sagesse managed to get a second victory. This time they won against fifth-ranked Byblos in Beirut 90-76. It ended at the same time the two-game winning streak of Byblos. Worth to mention a great performance of American guard Ramel Curry (191-80, college: CSU Bakersfield) who helped to win the game recording 24 points. Keanau Post contributed with 14 points, 12 rebounds and 5 blocks for the winners. 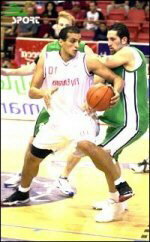 Swingman Mark Khoury (196-98) answered with a double-double by scoring 23 points and 11 rebounds for Byblos. Sagesse maintains ninth place with 2-14 record. Byblos at the other side keep the fifth position with ten games lost. They share it with Hoops. Leader Champville delivered the thirteenth victory on Thursday night. This time they beat 7th ranked Atlas F. (4-12) 80-68 in Zahle. It was a great evening for Fadi El-Khatib who led his team to a victory with a double-double by scoring 31 points, 13 rebounds and 4 assists. Champville's coach Fuad Abou Chakra used a ten-player rotation which allowed the starters a little rest for the next games. At the losing side Darian Townes responded with a double-double by scoring 18 points, 13 rebounds and 4 assists. Champville maintains first place with 13-3 record. Atlas F. lost fourth consecutive game. Newly promoted team dropped to the eighth position with 12 games lost. The game in Tripoli supposed to be also worth to mention about. 6th ranked Hoops Club (6-10) played at the court of seventh ranked Al Moutahed (5-11). Al Moutahed smashed Hoops Club 80-53. It was an exceptional evening for Hassan Dandach who led the winners and scored 17 points, 6 rebounds and 6 assists. The winner was already known earlier in the game, so both coaches allowed to play the bench players saving starting five for next games. Al Moutahed maintains seventh place with 5-11 record. Newly promoted Hoops Club dropped to the fifth position with ten games lost. Leader Champville delivered the thirteenth victory on Thursday night. This time they beat 7th ranked Atlas F. (4-12) 80-68 in Zahle. Champville looked well-organized offensively handing out 21 assists. It was a great evening for the former international forward Fadi El-Khatib (198-79) who led his team to a victory with a double-double by scoring 31 points, 13 rebounds and 4 assists. American forward Dewayne Jackson (203-90, college: Morgan St., agency: Higher Vision Sports) helped adding 21 points, 6 rebounds and 7 assists. Champville's coach Fuad Abou Chakra used a ten-player rotation which allowed the starters a little rest for the next games. At the losing side American power forward Darian Townes (208-84, college: Arkansas) responded with a double-double by scoring 18 points, 13 rebounds and 4 assists and the other American import guard Ghassan Nehme (190, college: Fair Dickinson) scored 13 points. Champville maintains first place with 13-3 record. Atlas F. lost fourth consecutive game. Newly promoted team dropped to the eighth position with 12 games lost. The game in Tripoli supposed to be also worth to mention about. 6th ranked Hoops Club (6-10) played at the court of seventh ranked Al Moutahed (5-11). Al Moutahed smashed Hoops Club 80-53. It was an exceptional evening for point guard Hassan Dandach (187-91) who led the winners and scored 17 points, 6 rebounds and 6 assists. American point guard Marvelle Harris (196-93, college: Fresno St., agency: Slash Sports) accounted for 21 points and 4 steals for the winning side. Four Al Moutahed players scored in double figures. American power forward JMison Morgan (211-89, college: Baylor, agency: Interperformances) came up with 13 points, 5 rebounds and 4 blocks (on 6-of-7 shooting from the field) and Ali Mansour (-98) added 9 points and 7 rebounds respectively for Hoops Club in the defeat. The winner was already known earlier in the game, so both coaches allowed to play the bench players saving starting five for next games. Al Moutahed maintains seventh place with 5-11 record. Newly promoted Hoops Club dropped to the fifth position with ten games lost. Bottom-ranked Sagesse managed to get a second victory. This time they won against fifth-ranked Byblos in Beirut 90-76. It ended at the same time the two-game winning streak of Byblos. It was a great shooting night for Sagesse especially from behind the arc, where they had solid 55.0 percentage. Their players were unselfish on offense dishing 22 assists. They brought some defensive toughness making 7 blocks. Worth to mention a great performance of American guard Ramel Curry (191-80, college: CSU Bakersfield) who helped to win the game recording 24 points. Canadian power forward Keanau Post (211-92, college: Missouri, agency: Slash Sports) contributed with a double-double by scoring 14 points, 12 rebounds and 5 blocks for the winners. Four Sagesse players scored in double figures. Swingman Mark Khoury (196-98) answered with a double-double by scoring 23 points and 11 rebounds and American forward Malcolm Riley (196-93, college: Texas Southern) added 21 points and 6 rebounds in the effort for Byblos. Sagesse maintains ninth place with 2-14 record. Byblos at the other side keep the fifth position with ten games lost. They share it with Hoops. The most exciting game was a derby match between two local teams from Beirut: Homentmen (#3) and Al Riyadi (#2). Homentmen (12-4) won against visiting Al Riyadi (12-4) 112-97. It ended at the same time the three-game winning streak of Al Riyadi. Homentmen dominated down low during the game scoring 62 of its points in the paint compared to Al Riyadi's 42 and made 20-of-23 free shots (87.0 percent) during the game. U.S. Virgin Islands-Puerto Rican point guard Walter Hodge (183-86, college: Florida) fired 50 points (!!!) and 9 assists for the winners. International forward Gerard Hadidian (201-95, college: Lake Land CC) chipped in a double-double by scoring 14 points and 10 rebounds. Naturalized Egyptian power forward Ahmad Ismail (205-76) produced 29 points and 8 rebounds and American forward Justin Brownlee (197-88, college: St.John's) added 19 points and 6 rebounds respectively for lost side. Both teams had four players each who scored in double figures. Defending champion moved-up to second place, which they share with Al Riyadi and Beirut Club.